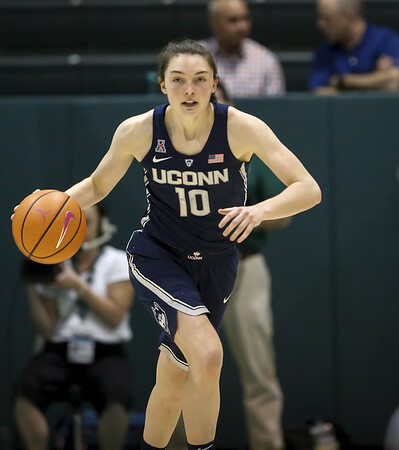 Molly Bent feels a sense of urgency as the junior guard enters the second half of her career with the UConn women’s basketball team. She’s been to the NCAA Final Four twice with the Huskies and the team’s record is 72-2. But both times UConn’s bid for a 12th title ended with a last-second overtime loss in the national semifinals. What’s been even more difficult for the Centerville, Mass., native to take, though, is that she has not put herself in a position where she could make a difference. “I would describe last season as disappointing, individually and for our team,” Bent said. “It wasn’t the outcome that we wanted. But I knew coming here that it wasn’t going to be easy. Bent averaged 1.0 points and 1.2 rebounds in 31 games off the bench as a sophomore, the same averages she had as a freshman after coming to Storrs from Tabor Academy in Massachusetts. While she raised her field-goal percentage to 47.8 from 30.3, her 0.6 assist-to-turnover ranked 12th on the 12-player roster. She did have nine points, four rebounds, and three steals in a win over Wichita State Feb. 10. But with classmate Crystal Dangerfield’s emergence and the veteran presence of Kia Nurse, minutes were hard to come by. By the time coach Geno Auriemma turned to her, the outcomes were decided. Nurse has moved on to the WNBA’s New York Liberty. Bent and sophomore Mikayla Coombs will compete for minutes behind Dangerfield. The Huskies have also added guard Christyn Williams, the consensus 2018 high school Player of the Year to the mix. Bent, who has earned Dean’s List honors in all of her semesters at UConn, hopes her experiences and smarts are advantages. For the next five weeks, Bent’s work will be done on her own. The Huskies will return to campus in late August for the start of fall semester classes. There’s a sense of urgency for her to live up to expectations. And she knows the clock is running. Posted in New Britain Herald, UConn on Monday, 16 July 2018 21:25. Updated: Monday, 16 July 2018 21:28.